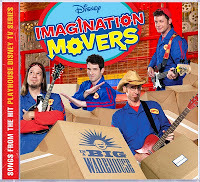 A signed copy of the Imagination Movers' new CD, "In A Big Warehouse". Happy Fall from the Night Light Stories household. Personally, this is my favorite time of year. The leaves turning bright reds, oranges and yellows; the crisp, cool air; eating warm apple pie made with fresh picked apples, and of course watching football on Sundays! We also really enjoy decorating for the season with pumpkins, scare crows and skeletons! Some of the decorations we’ve been seeing around the mountain are a little bit spooky. Mr. Chris and I were talking about how the kids would see the haunted houses and we wondered if they would be scared? Sometimes its fun to be scared and that’s how the Heebie Jeebies was born. If you like what you hear at Night Light Stories, please go to iTunes and leave a review. More positive reviews make it easier for others to find Night Light Stories in the iTunes Store. Don't forget you can also find us on Twitter at nightlight08 and our Facebook Fan Page. Stay tuned for more Night Light Stories, Lighting the Way With Words, and updates on the book. Thanks so much for your continued support! A way the Night Light Stories keeps the Heebie Jeebies at bay is by listening to some positive, fun and creative music while having a dance party in our well lit kitchen. We slip and slide all around the floor and create all sorts of crazy dance moves. You should see Mr. Chris go! So, since this works for us, we thought it could work for you too. We just so happen to have a really upbeat CD to give away. The CD is of one of our favorite children music bands; the Imagination Movers. We wanted to give you a chance to win an autographed copy of their newest CD, “In A Big Warehouse”. To enter, first visit the Imagination Movers website and explore all around. Dance to some songs, check out the pictures, play a few games and read their bios. Then, come to the Night Light Stories website and leave a comment about what you found most interesting, fun, or inviting about this intriguing foursome. You can also leave us a comment on the Facebook Fan Page, Twitter at nightlight 08 or email us at nightlightstories@gmail.com. The contest will run until October 31st at Midnight. If you do not win, no problem! 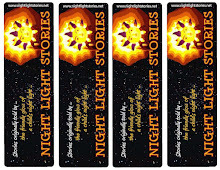 On the side bar of the Night Light Stories website there is a link to the Imagination Mover’s store. If you buy a CD and put “NIGHT LIGHT STORIES” in the comment section when checking out, the Movers will sign their names on the CD for you. What did you say? A word of the day! In our story there are many juicy words that are fun to use and say. 1. Write your own spooky story. Who are your main characters? Where is your setting? What are the problems in the story? What are the solutions? 2. List THREE strategies the child in bed uses to keep from getting the Heebie Jeebies. Add THREE new strategies you could use to keep yourself from getting the Heebie Jeebies. 1. What made the narrator clutch at his blanket? 2. Who told the narrator a spooky tale before bed? 3. Why does counting sheep not work for the narrator? Happy Halloween from Night Light Stories! As always, we look forward to the many scary stories we can share together. 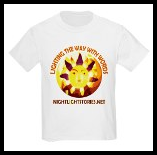 LIGHTING THE WAY WITH WORDS:Halloween style!